Evannex.com displayed a gorgeous one-of-a-kind sculpture "Driving the Future" - an artwork tribute (1/5 scale) of the Tesla Model S - in addition to a complete showcase of their electric vehicle products. And, we've also confirmed that Reus Audio Systems was in attendance (coming all the way from California) doing high end sound demos at the event. Signature Custom Wraps showed off some stunning vinyl wraps (including all-chrome, matte black, matte blue, and more) on local Tesla Model S vehicles. Electric Car Insider gave away issues of their popular magazine. And live music was featured from FPL (Florida Power & Light). Voted writer of the all-time best posts by Tesla's own forum members, Tesla expert Nick Howe was featured at the event. Nick is also host of the must-see Youtube electric vehicle video show "News from the Frunk" and author of the ultra-popular book "Owning Model S". Also, Brooks Weisblat, owner of dragtimes.com, has the fastest published Tesla P85D... he was there! This is shaping up to be an epic event. Pre-register for an afternoon of electric vehicle fun featuring outdoor and indoor activities including a parking area for EVs, live music, ping-pong, food trucks, refreshments, beer and wine, and an electric vehicle accessories and parts showcase. We'll also have fun give-away items that should prove handy for electric vehicle owners including charging courtesy notices, charging hangtags, and more! The event is also family and dog friendly. Come by (rain or shine) as the site location, LauderAle, has a large indoor area and much of the event will be shaded under special tented areas in the parking lot area as well. Evannex.com Aftermarket Tesla Accessories will display a gorgeous one-of-a-kind sculpture "Driving the Future" -- an artwork tribute (1/5 scale) of the Tesla Model S -- in addition to a complete showcase of their electric vehicle products. And, we've also confirmed that Reus Audio Systems will be in attendance (coming all the way from California) to do high end sound demos at the event! Signature Custom Wraps will be showing off some stunning vinyl wraps (including all-chrome, matte black, matte blue, and more) on local Tesla Model S vehicles. Electric Car Insider will be giving away issues of their popular magazine. And live music on stage and fun giveaways will also be featured from FPL (Florida Power & Light). Voted writer of the all-time best posts by Tesla's own forum members, we've also confirmed that Tesla expert Nick Howe will be in attendance. Nick is host of the must-see Youtube electric vehicle video show "News from the Frunk" and author of the ultra-popular book "Owning Model S" and will be available to sign copies (limited quantities will also be on-hand for sale at the event). 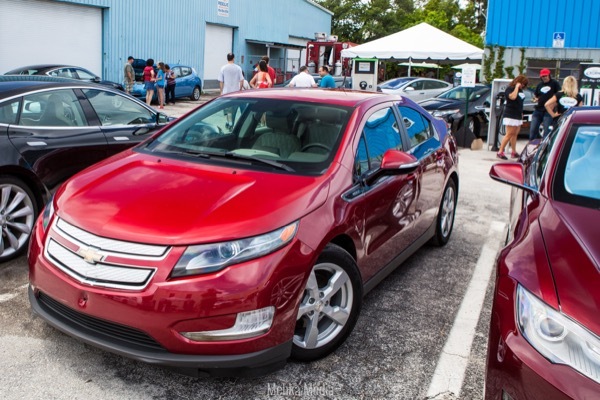 An active, on-site charging station and promotional Chevy Volts from Doc Bornee USA will also be at LauderAle on display. For a complete list of other local charging stations, please visit plugshare.com -- also, for Tesla owners: please note that the Tesla Dania Beach Service Center location is only 20 minutes away from the venue (visit: teslamotors.com for a map of local charging). **Please confirm your attendance by August 24th in order to receive your requested t-shirt. Any attendees that registered after this date will not be guaranteed a t-shirt. However, the first 100 attendees will receive a special gift bag. Note: This event will be filmed, please be aware by entering the event you consent to and authorize without compensation, all sponsors and their successors/licensees to use your voice and likeness and to photograph/video you to use worldwide for all media in perpetuity. And you release all event sponsors from any liability on account of such usage. LauderAle is located in the industrial district directly between Fort Lauderdale/ Hollywood International Airport and Port Everglades on Eller Drive and SE 14th Avenue. Head South on Andrews Avenue until you reach the flashing red light at 7th Avenue. Turn right then make a quick left to continue East on Eller Drive. Make your first left under the 595 over pass. Make another left to head back West on Eller Drive (you basically just made a U Turn). Make your first right on SE 14th Ave. LauderAle is behind the third building on the left. Head East on I-595 and follow the signs towards Port Everglades. At the McIntosh Road light (you will see the entrance to Port Everglades in front of you) turn left. This takes you back west on Eller Drive. Make your first right on SE 14th Ave. LauderAle behind the third building on the left. Turn right on SE 10th Street/Griffin Rd. This street turns into SE 7th Ave. Follow the road around until you reach the I-595 overpass. At the fork stay to the right and head East towards Port Everglades. Make your first left under the 595 over pass. Make another left to head back West on Eller Drive (you basically just made a U Turn). Make your first right on SE 14th Ave. LauderAle is behind the third building on the left. Please feel free to text / call Lauren Bordelon at: 561-289-3376 if you are having trouble finding the location. There are currently 219 attendees registered. Registered attendees report 818,076 electric miles driven.